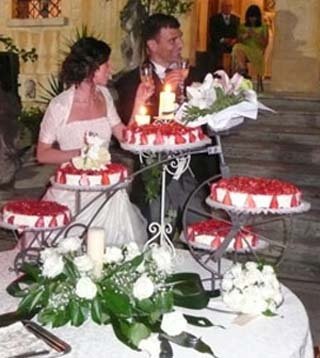 Need Cheap Wedding Cake Ideas? 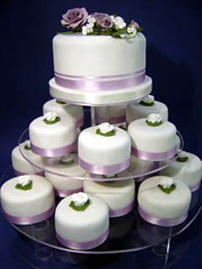 Bridal cakes, like most other items are expensive and will take a slice out of your budget. I’m here to help you have a beautiful, tasty bridal cake without costing you a fortune. Tell your friends, family and coworkers that you are looking to save money and are looking for an inexpensive way to have a beautiful cake. Ask them if they know anyone who bakes as a side business. Typically, they work out of their home and have low overhead costs, thus they can pass the savings on to you. Since cakes need to be fresh and you have enough to do on your special day, I would not recommend doing your own baking or decorating. However, if you have a friend or family member who is a good baker and a creative designer that you trust to create a confectioner's delight, go for it. 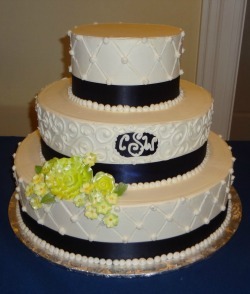 The cake below is classy and very elegant, not cheap looking by any stretch. Supermarket prices for bridal cakes tend to be much lower than your local bakery shop and have quite a large number of options to choose from. Choosing a cake that doesn't have a lot of decorations will save you a few dollars. A butter cream frosting is less expensive than a fondant of whipped cream frosting. This wedding cup cake idea isn't for every bride however, as shown above, you may want to consider purchasing a tiered cupcake holder and have cupcakes as your wedding cake. Look in your newspaper for cake designing classes. 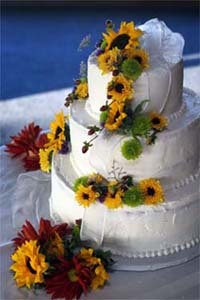 Talk to the instructor and determine if they, or someone they know makes bridal cakes. You’ll get a beautiful creation at a reduced cost. On the same vein, you can also check out your local community college or adult education program for cake decorating classes. If you have decided to hire a professional baker, talk to the baker about cost saving ideas. If you choose a cake that is not time intensive to decorate, the baker will work with you on the price and offer you a price within your budget. Some fillings are less expensive than others, so opt for a basic filling such as vanilla cream, chocolate or lemon. Fruit, mousse, cannoli cream and other exotic fillings are rather expensive and will add to the cost. There are many lovely cake toppers to choose from, so purchasing your own will be cost effective and give you the exact look that you want to achieve. The below strawberry decorated cheesecake was prepared by several friends of the bride. Each individual cake was placed on the tray. This inexpensive cake looked like a million bucks and definitely did not look cheap. 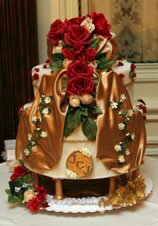 Hopefully, my cheap wedding cake ideas will help you stay within your budget and have the magnificent cake that you desire. Need more professional help? Peruse my home page here.